Steam mops for use to clean home floors have become an extremely popular way to clean residential floors. You can barely turn on the television without seeing a commercial or advertisement for clean home steam floor mop. So our readers who are considering making the purchase of a steam floor mop to clean their floors at home are asking do they work. The short answer is yes. But the goal of this article is to provide our residential homeowner readers with the second question that is asked how simple and easy it to use is. We will address this question in further detail below. The again the short question is yes. Steam floor mops are simple and easy to use. They are extremely effective. Later near the end of this article, we list a couple of websites of the more popular brands of steam floor mops. We also list a website link on the consumer research reports on the steam floor mops for those readers that might want to do more research on which model or brand of steam floor mop they want to purchase. 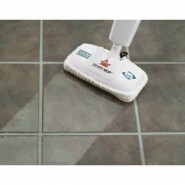 Steam floor mops use a highly effective way to clean floors. If you are a regular visitor of keeping floors clean.com, you most likely have read the four basic principles of cleaning which include the principle of Temperature. Of course, steam is water that is converted into steam by the use of heating the water to a high temperature. It is the combination of the high temperature (Steam) and the microfiber pad that provides the cleaning. This is accomplished with little agitation and no cleaning chemical. Just the steam and microfiber pad provide enough cleaning power to get the job done. Steam floor mops clean a variety of floors in a home. So it makes it a versatile cleaning tool. Below is a list of the floors it cleans. So it is simple, you need one tool to clean all the floors in your home. Steam floor mops are easy to use. Simply fill the water reservoir with water, put on the microfiber pad to the head of the machine, plug the electrical cord in the outlet, turn the steam floor mop on and allow the unit to heat up to create steam. It is as simple and easy as running a vacuum cleaner and is a greener way to clean your floors because it requires no cleaning chemical to clean. So, it is easy, simple and good for the environment.